Injection molded nylon. 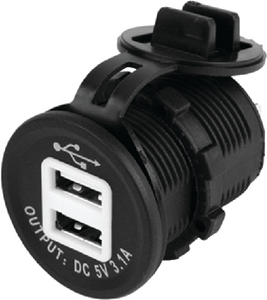 Input 12V - 24V, Output DC 5V/3.1A. Total output is 3.1A with the load being split between the two sides as needed - enough to charge iPhones, iPads and almost all other devices. Fits Sea-Dog line power socket shell.